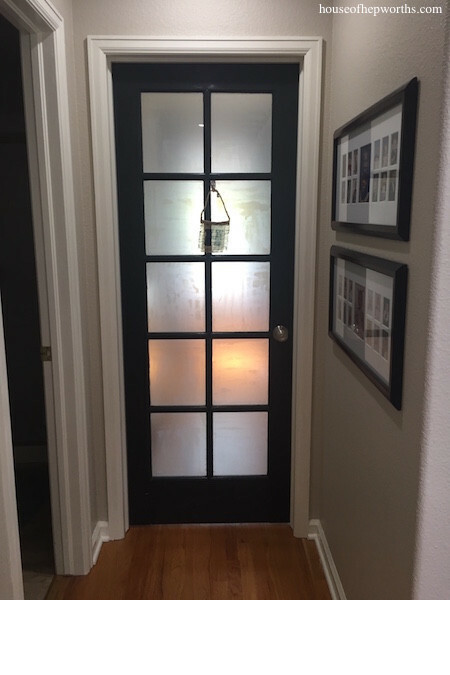 Did you know you can FROST GLASS with contact paper? Today I’m sharing a simple tutorial for frosting glass with contact paper that will change your life. Seriously. It’s that good. Would you like more privacy in your home without sacrificing the light streaming in? Just frost your glass! 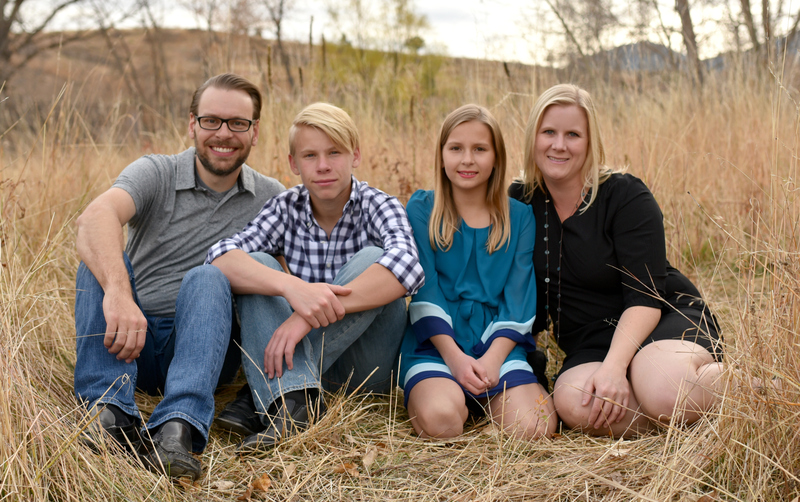 It’s so easy, inexpensive, and is totally removable. Yup, unlike sprays and other frost glass techniques, this one allows you to undo your frost if you ever change your mind. Mind blown, I know. 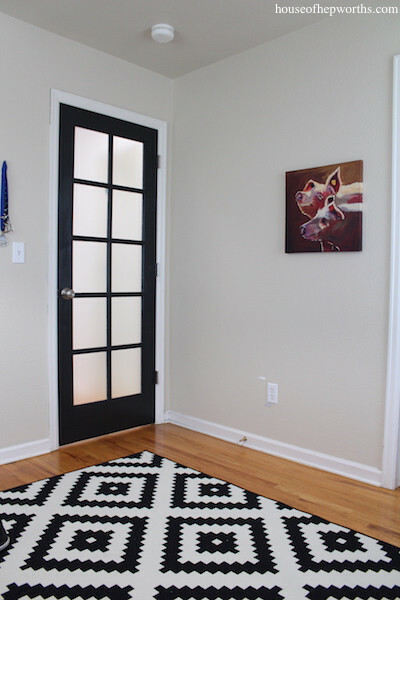 I started out with a 10-panel glass door painted white. Last year I painted it black. I LOVE black doors! 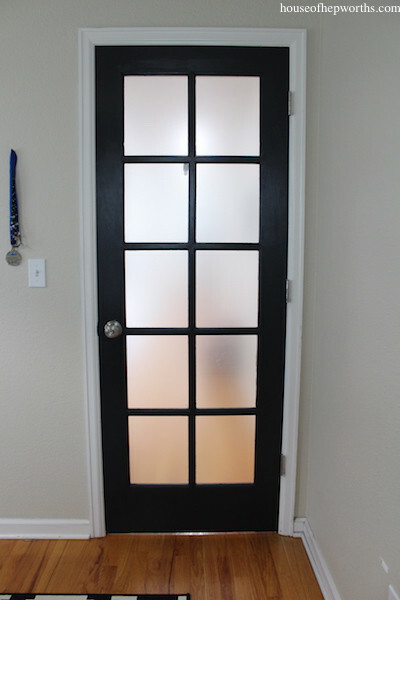 As much as I love this 10-panel glass door, especially now that it’s black, we need some privacy without having to replace the entire door. 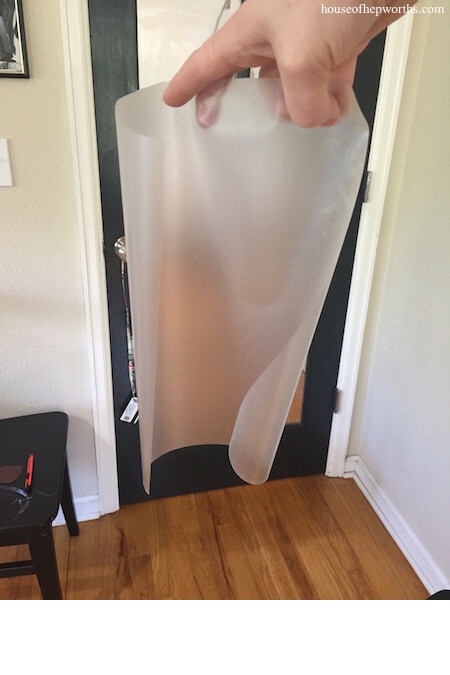 Enter Contact Paper. This stuff is amazing and awesome and sooooo cheap! I purchased clear Contact Paper. You can find it here if you want to order some. 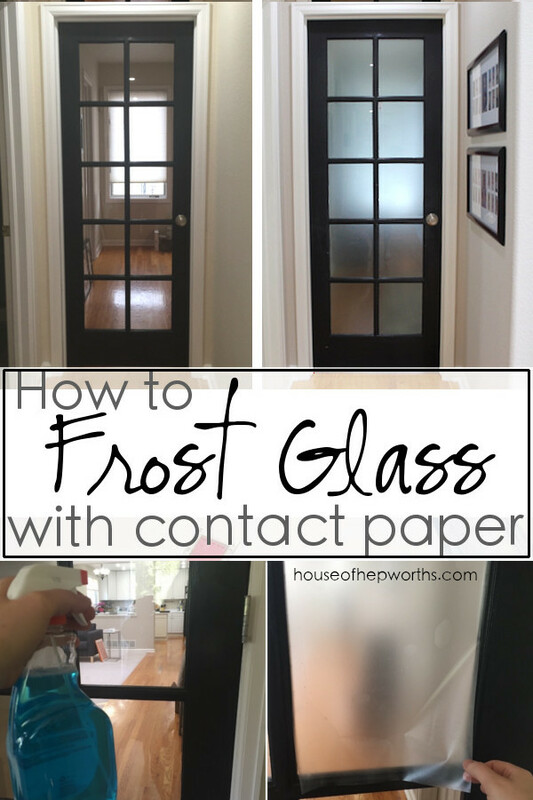 Yes, all you need is clear contact paper to frost glass! 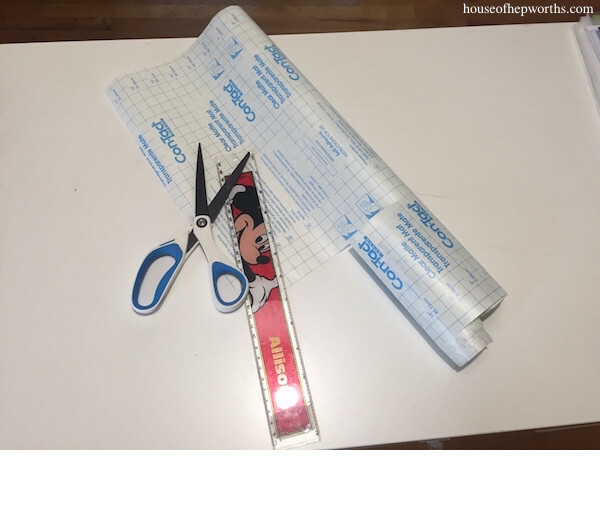 Measure your window and cut your contact paper about 1/2″ wider than your window. This will allow some wiggle room and a perfect tight fit. I cut a bunch of my panels at the same time. 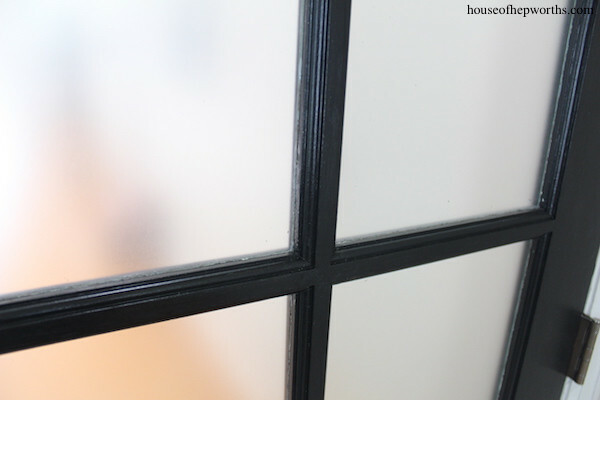 Once you have your panel cut, you want to spray your glass panel with windex. Make sure the entire surface is covered. 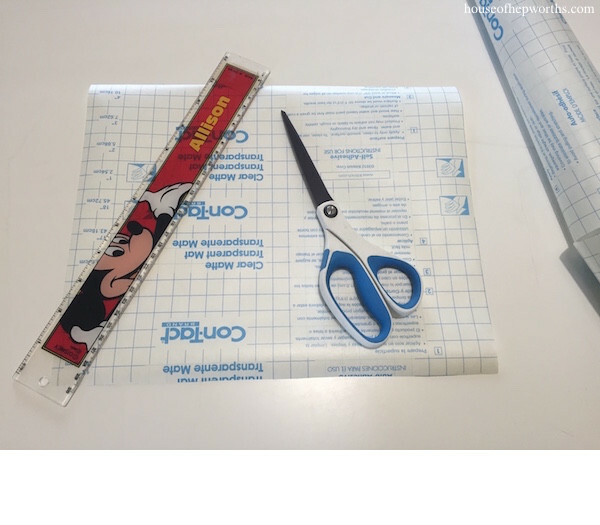 This allows you to place the contact paper on and slide it around to get it where you want it. Trust me on this. 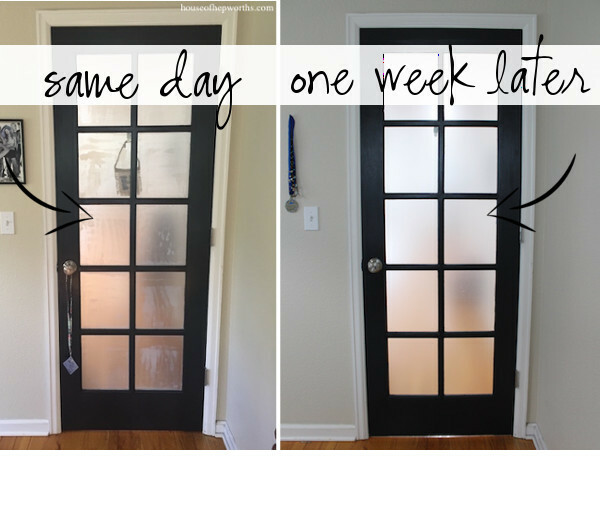 The windex will dry and you will be left with a perfect panel of frosted glass. Carefully remove the back paper from your contact sheet you just cut to size. 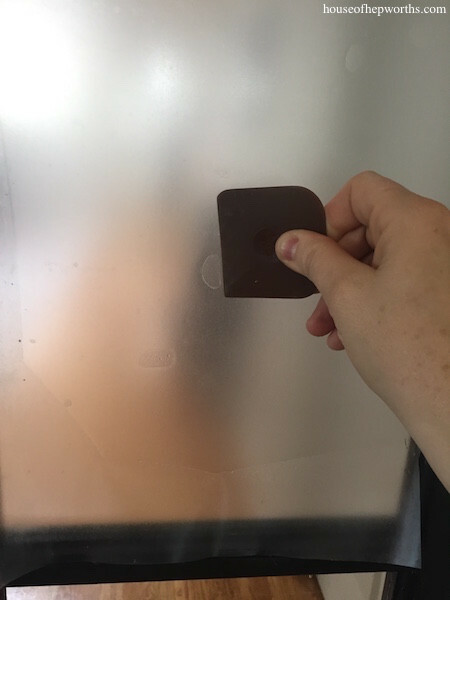 If you are not careful you will leave a permanent crease on your contact paper that you will see on the frosted glass. Take your contact sheet and stick it to your panel with the windex on it. It will feel slippery. This is good. You want to be able to position it exactly where you want it. 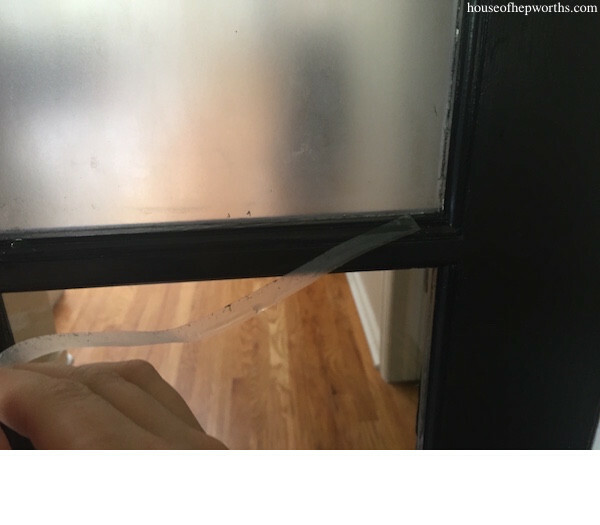 Now, take a credit card or a scraper (not metal or it will puncture your contact paper) and start pushing all the bubbles and windex towards the edges of your window. 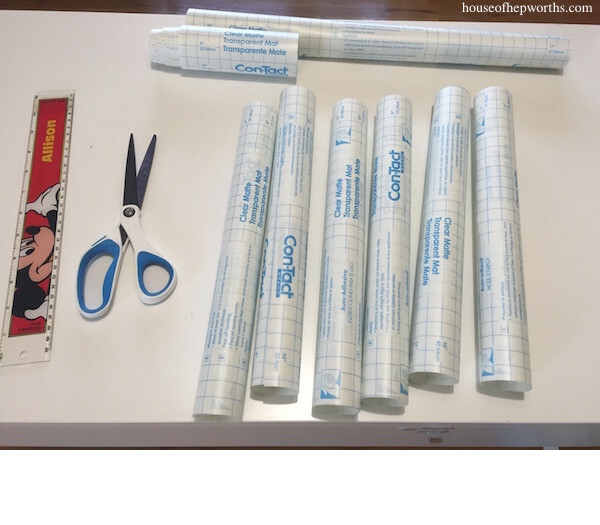 Once you have pushed all the bubbles out, take a utility knife and carefully cut the excess contact paper away. 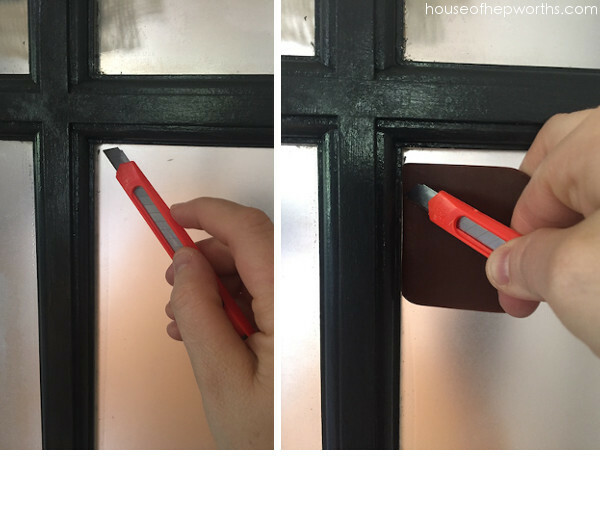 I’ve found if you use it in conjunction with the plastic scraper, you will get a perfect cut. 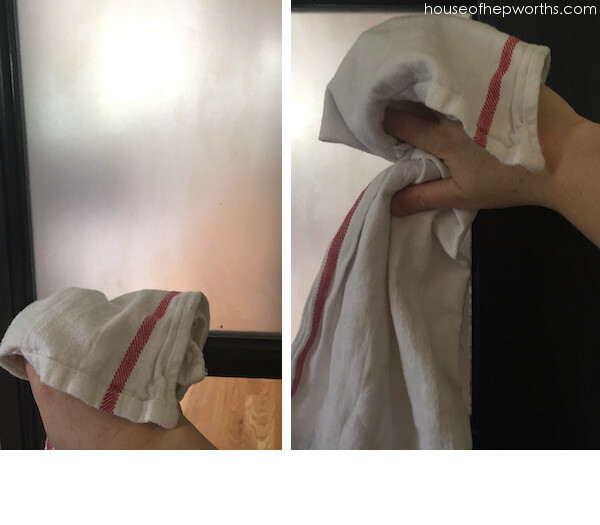 Once you’ve trimmed all the excess off, take a rag and wipe all the windex off. Don’t be alarmed! It is supposed to look streaky and wet. Remember, there is windex behind your contact paper. It goes from looking amateur to looking like a professional frost glass job. They look so good you would have thought I hired a company to come out and frost these windows! A close-up. 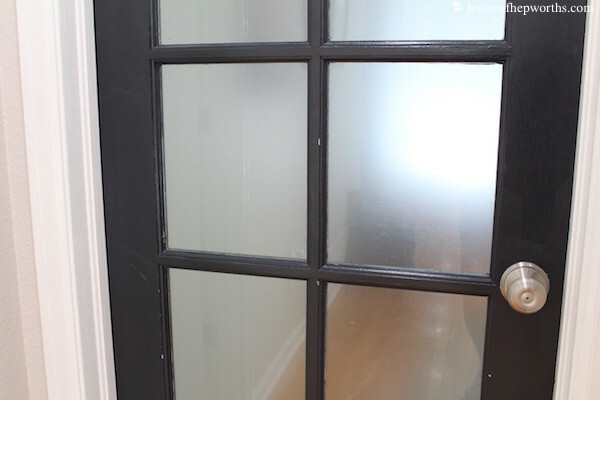 The frost is on the opposite side of this door, so you are looking at the back of the frost glass job. 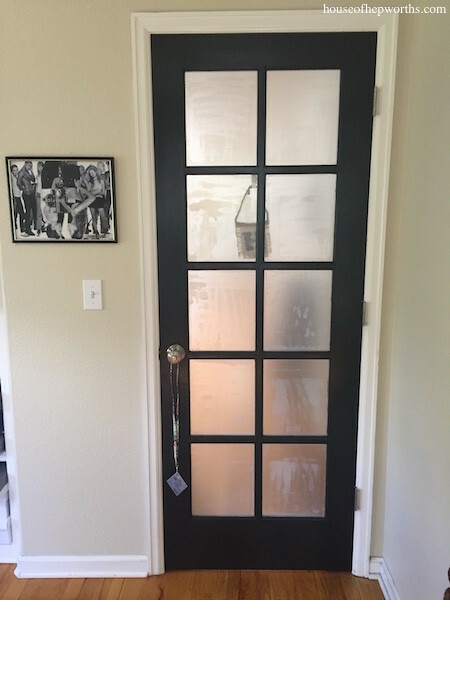 Here’s the frosted glass door on the side I frosted. Once you frost your windows, you literally cannot tell which side you put the frost on unless you feel it with you hand. The frosted side feels like the contact paper, while the unfrosted side feels like glass. Amazing, right?! 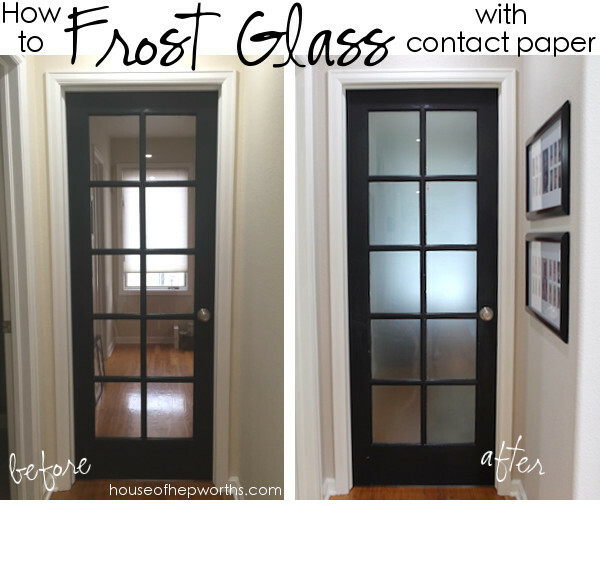 That is literally how easy it is to frost glass with contact paper. 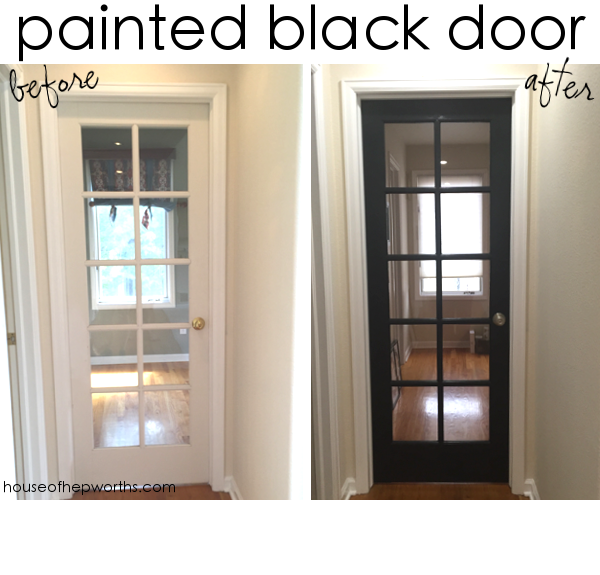 I love the door but like you….I love it black! And adding the frosted contact paper really makes it look great. So awesome, love it. 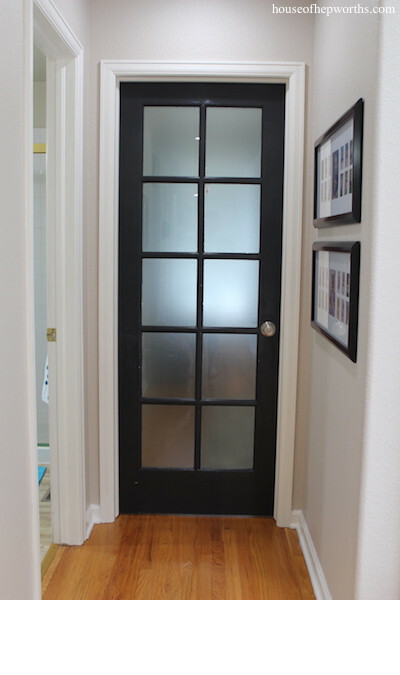 I would love to put a French door for our bedroom door between our room and mudroom but not give up privacy. 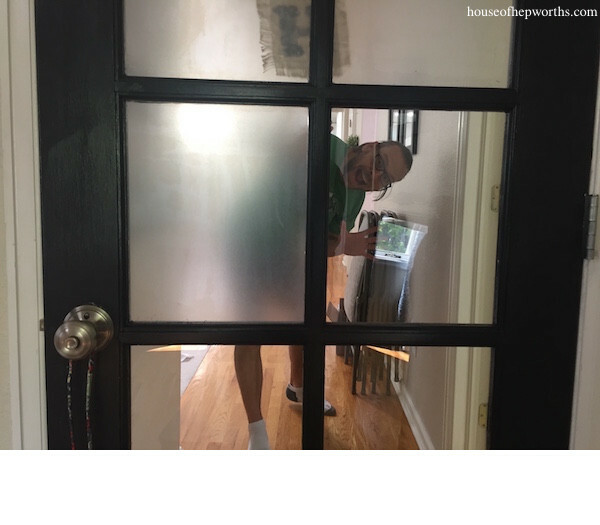 Not holding my breath however til we can afford a French door. 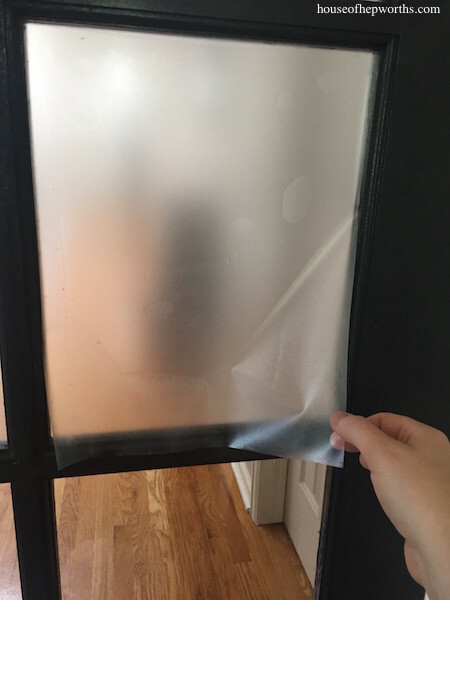 Seeing how wonderful your black door looks am thinking about putting clear Contact paper on bottom parts of our living room and bedroom windows, little more privacy at least. See what you started? Now I need to print out how you put contact paper on your door so I don’t forget about the windex first. Hi! I was wondering how this was holding up a year later. It looks amazing and I’m hoping to do this soon on my paneled front door. Thank you! I love this! Thank you! 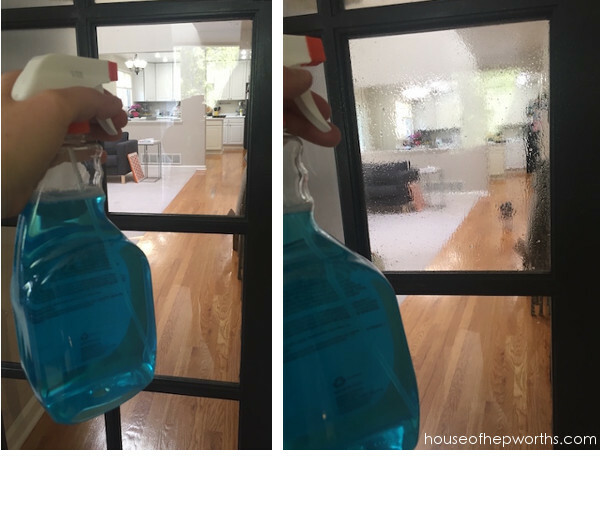 Does it have to be Windex? I just use peroxide to clean my glass (which works great, BTW) and don’t have Windex around. Thanks so much! How do you remove it and will it cauz damage? Im a renter and i have a large balcony door and kitch window that I need to do.. I love this! Thank you for sharing! Question: Does it have to be Windex or just anything wet? I don’t use Windex. I use peroxide to clean my glass (which works great, BTW!). Im wondering if I can use that instead…? Thanks!